[New for Summer 2016] Snow had me running late yesterday and my car was running low on gas, so I pulled into Cumberland Farms to fill up me and the gas tank. Now these sandwiches are $2.49 a piece (though they can be on sale from time to time) and they are pretty hefty, this one in particular is 450 calories (and 7g of protein). That's a good size snack that will hopefully curb my hunger for more than 30 minutes. The other three flavors are Blissful Chocolate Brownie, Outrageous Vanilla Chocolate Chip, and Cool Mint Chocolate. Note: I did find a small group of people pretty frustrated with the fact that Cumby's ditched Chewy Louie in favor of these. The most important thing to point out is that while the large cookies provide most of the texture, the fairly thin ice cream layer provides the majority of the flavor. The black raspberry is quite bold, a little too bold for me personally. I wish the raspberry flavor was toned down and instead have a filling that is a bit more sweet and creamy, but overall the treat still works pretty well. It's probably best that it's too bold instead of too mild. 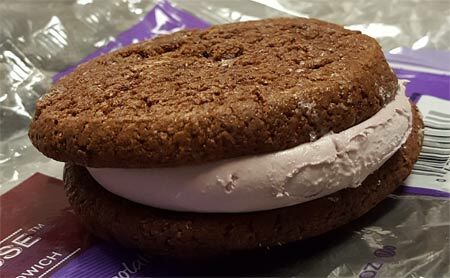 I also like the fact that black raspberry was an option in the first place (I made this exact same ice cream sandwich combo many moons ago). The cookies are fine, no complaints. 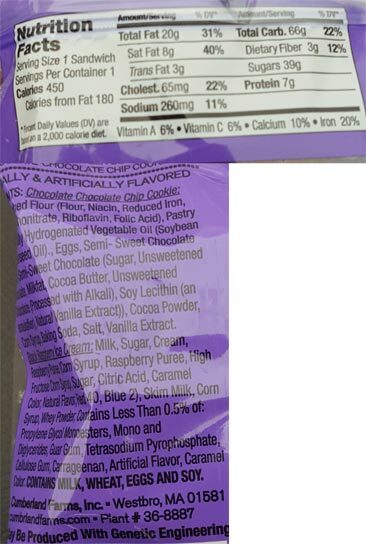 A fine chew, not too hard, plus you get the occasional chocolate chip/chunk. The cookies didn't really stick to my hands which is always appreciated. (yes I could have left it in the wrapper but I needed to take photos). I could have pulled off a piece of cookie to test it but I was enjoying it the way it was. So, will I buy these again, yeah, pretty sure I will. 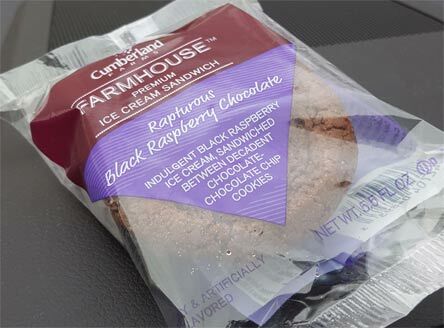 I love ice cream sandwiches and this these do find to fix a craving. I will just add the disclaimer that I don't know if some sandwiches are more filled than others because this particular Cumby's decided to stack a whole bunch of windshield washer fluid in front of the freezer. I could only partially open the door and then I had to reach around and grab the only sandwich I could get my hand on.